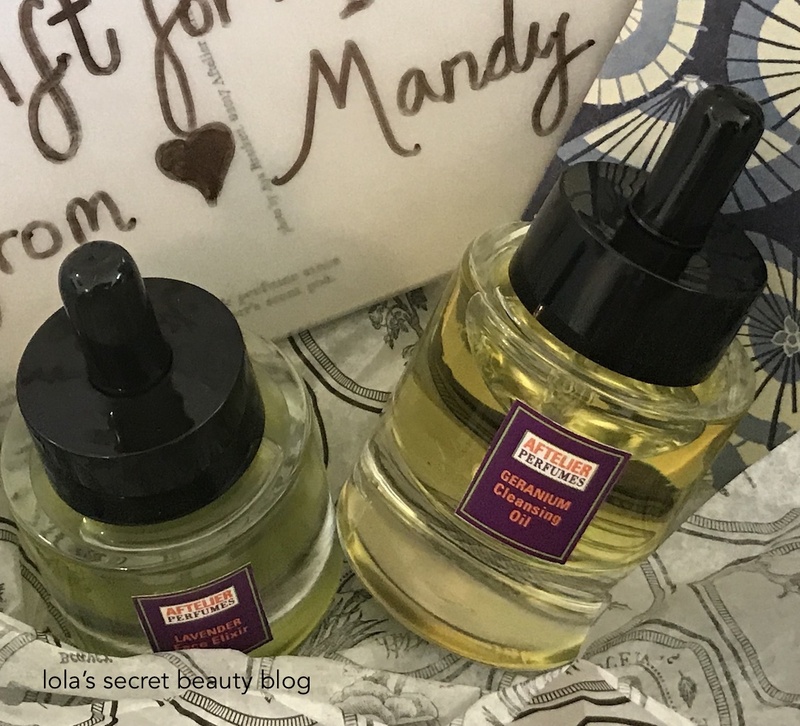 I have extolled the virtues of Mandy Aftel's handmade Face Elixirs for many years now, and with each new addition to her brilliantly curated collection one wonders how she could possibly outdo herself, and yet she always does. The NEW Aftelier Perfumes Lavender Face Elixir is the most sophisticated, refined and intoxicatingly beautiful permutation of lavender that could ever be imagined. 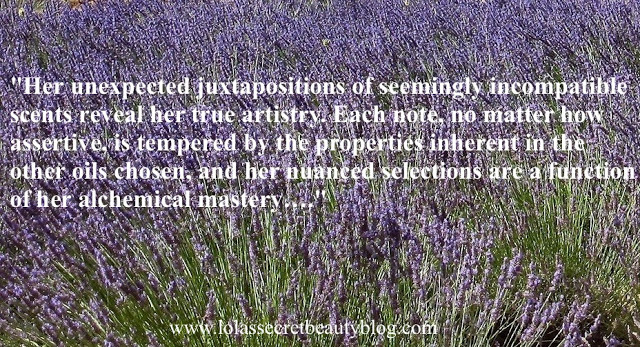 In my estimation, lavender is one of the most difficult aromas to capture properly. In less capable hands, it is often far too pungent, overpowering, and can actually be off-putting. Conversely, on the other end of the spectrum, lavender is rendered too sweet, too floral or too artificial. The seemingly impossible balance has been struck by Mandy, and therefore the aroma of her Lavender Face Elixir nearly defies description. Mandy's brilliance is, in part, a function her ability to unite disparate elements into a single beautiful and heavenly elixir. Her unexpected juxtapositions of seemingly incompatible scents reveal her true artistry. Each note, no matter how assertive, is tempered by the properties inherent in the other oils chosen. and her nuanced selections are a function of her alchemical mastery (and this is accomplished at the most cultivated level). Mandy's Lavender Face Elixir is unlike anything that you have ever experienced. It is soft and refined, without any pungency, yet it maintains all of the soothing and comforting aromatherapeutic qualities that one expects to find in lavender flowers on the stem. The aroma is soft, warm and creamy without any sharp edges. 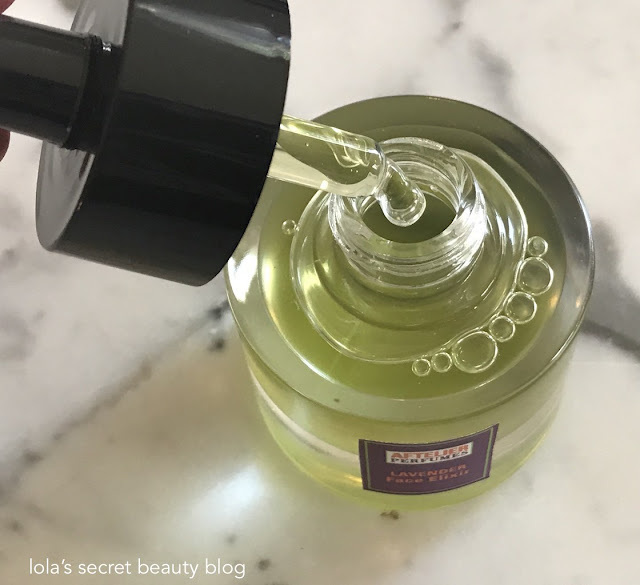 The lavender asserts itself without being forceful, and the velvety texture of the oil is the perfect textural complement to this elixir's otherworldly aroma. Mandy inherently, and rather magically, understands each of the ingredients that she carefully chooses to unite. She has described this process to me as one in which each of her Face Elixirs include a lot of the named essence and then she adds, "a few facets of aroma to them." The end result is the likes of which you have neither imagined, nor experienced in a fragrant lavender face oil. It is, in a word, extraordinary. As I have previously noted, "Mandy able to create artistic marvels by understanding the potential of each of the individual ingredients and then combining them in unexpected ways. She creates otherworldly masterpieces that defy simple description due to their chameleon-like complexity." 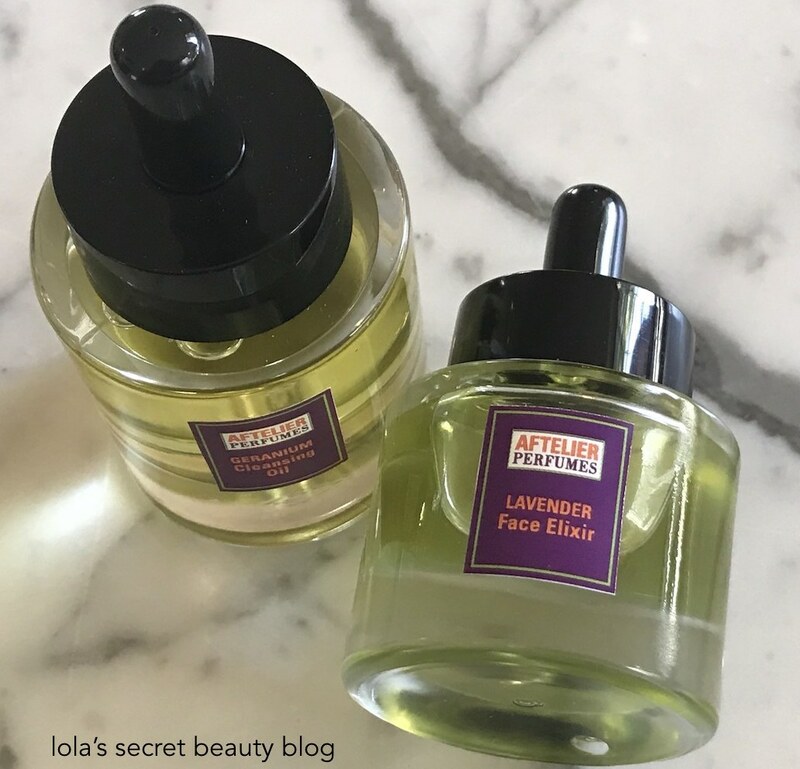 Lavender Face Elixir is lightweight and ultra-fast absorbing, and you will be delighted by the speed with which it melts into the skin. It is ultra-nourishing, deeply hydrating and it leaves skin remarkably soft, smooth, supple and luminous. The beautiful lavender aroma soothes the senses and quiets the mind, and it is therefore a wonderfully calming elixir that facilitates a restful and peaceful slumber. The new glass dropper bottles, that Mandy selected, are elegant, chic, minimalist and stunningly gorgeous. In fact, these bottles are so gorgeous that you will keep, rather than recycle, them. 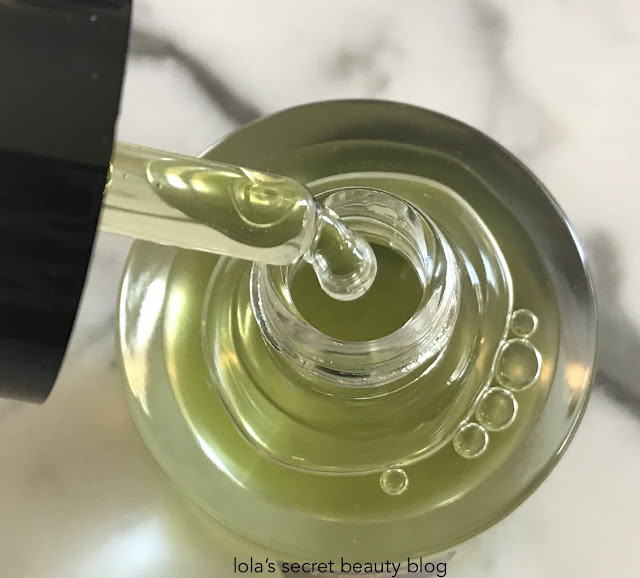 To celebrate 25 years of making face elixirs, I developed a new base blend of sustainably-produced broccoli seed, squalane, rose hip, peach kernel, and meadowfoam seed oils, in a gorgeous new bottle! My new Lavender version captures the scent of lavender flowers on the stem. Lavender Face Elixir captures the aroma of lavender flowers on the stem. This nourishing treatment for the face is immediately moisturizing, softening, and conditioning. Add no more than a dropperful of the elixir to the palm of your hand and press your other palm against oil to warm the oil. Then gently pat the oil into your clean face before bed. The lightweight non-greasy formula absorbs quickly into your skin. You will drift off to sleep in a light veil of fragrance that soothes and relaxes. When you wake up, your skin will feel wonderfully nourished and revitalized. Alternatively, add a few drops of face elixir to your foundation to nourish your skin and improve the texture. Our lightweight face elixir is immediately absorbed softening and conditioning your skin. Use on your clean face before bed, and drift off to sleep in a light veil of fragrance that promotes relaxation. When you wake up, your skin will feel wonderfully nourished and revitalized. Directions: Add some drops of the elixir to your fingertips and gently pat into your clean face before bed. This lustrous lightweight non-greasy formula absorbs quickly into your skin. You will drift off to sleep, in a light veil of fragrance that soothes and relaxes. When you wake up, your skin will feel silky, wonderfully nourished and revitalized. • Cold-pressed Broccoli Seed Oil is high in vitamin A and Omega-9, 6 and 3 fatty acids, which help absorb and retain moisture in the skin quickly without leaving behind a greasy residue. The smooth, soft, silky texture broccoli seed oil protects cells and is anti-inflammatory. • Squalane (from olives) is an incredible antioxidant, helps retain healthy moisture, is nourishing to the skin and promotes cell growth. Squalane protects and supports and helps repair the skin. • Rose Hip Oil is high in linoleic acid (45%) which absorbs quickly and deeply into the skin layers and carries plant nutrients to deeper layers. Loaded with Vitamin A and C, rose hip oil is nourishing, good for fine lines and wrinkles, elasticity and firmness. • Peach Kernel Oil has 60% oleic acid which helps maintain suppleness, flexibility and softness of the skin. It is highly compatible with human sebum and able to carry nutrients deeply into skin layers. Rich with Vitamin, A, B and E, peach kernel oil is emollient, moisturizing, nourishing, and protective. • Meadowfoam Seed Oil is unusually high in gadoleic acid, a very long chain fatty acid that helps protect the barrier function of the skin. This oil is anti-aging, detoxifying and rejuvenating. The beautiful postcards below are from Aftelier Perfumes Museum: The Aftel Archive of Curious Scents. To learn more, click HERE. Mandy Aftel is an award-winning all-natural perfumer and author. 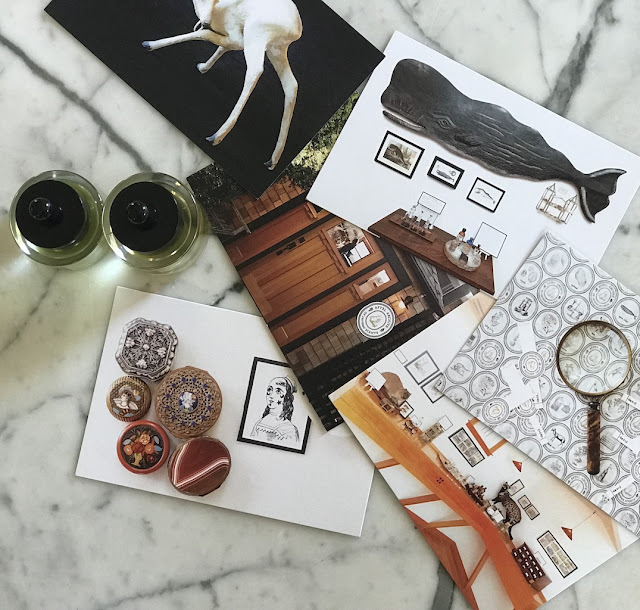 She creates each extraordinary Aftelier Perfumes fragrance by hand in small batches in her Berkeley, California studio. $76.00 for 20 ml. and $7.00 for a 1 ml. sample from Aftelier Perfumes (Unaffiliated Links). 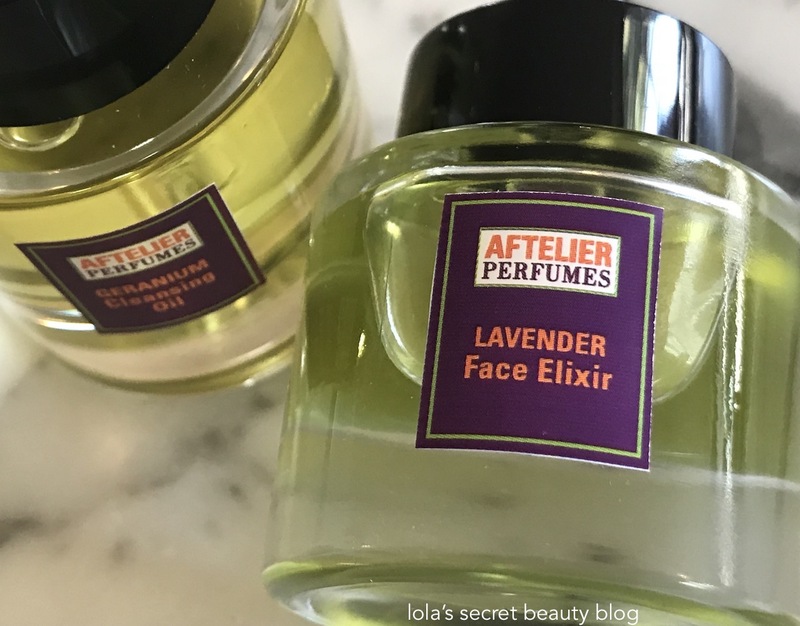 I've never tried a face elixir before but it sounds so lovely! You did an amazing job of describing the fragrance. Thank you for your very kind words, I am thrilled that my description resonated with you! This is an incredible face oil, and definitely one worth trying. It really is that amazing! My dearest Mandy, You are so very welcome. Thank you for your very kind words– they mean a great deal to me coming from you! I am tremendously honored that you see value in my writing! As someone who doesn't go near lavender you've changed my mind. I have a feeling that I would find this to be calming and a fragrance I'd enjoy. Mandy Aftel obviously has a gift like no other. 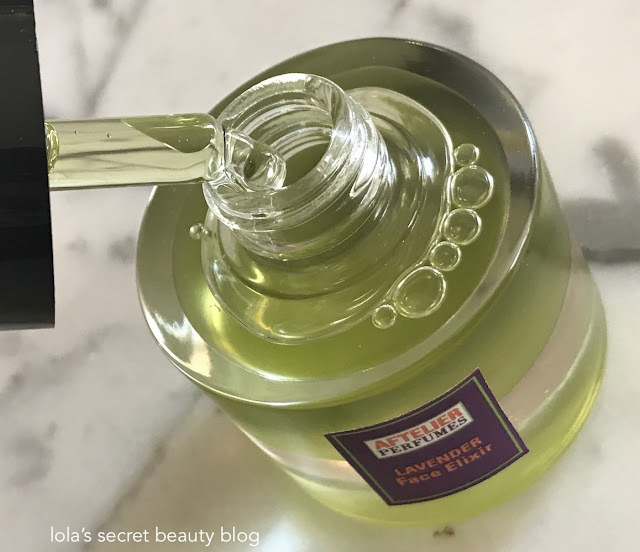 I love the smell of lavender on the stem, but I am generally not a big fan of the face and body oils that I have tried that tend to feature overpowering and pungent lavender essential oils. Mandy is a true artist with the most remarkable skills, and this lavender is unlike anything that I have ever experienced. It is as though she has removed all of the parts that I find overpowering and retained the most amazing components, and then she adds all of these other facets from other oils that make it an otherworldly masterpiece! It is definitely worth trying, and since she also sells tiny trial sizes you can try it without committing to a big bottle. You are quite right about her, Mandy truly does have a gift like no other! While it is unlike any lavender that you have ever experienced, it does contain lavender and therefore it wouldn't;t be a good fit for you, Courtney! The oil mix and soft, balanced lavender sounds perfect. The bottles are beautiful, they would make gorgeous, tiny little vases for gorgeous, tiny little flowers and arranged on a vanity tray. It is unmitigated perfection, truly. There is no sharpness, whatsoever– it has a sublime aroma. Yes, the bottles would be absolutely perfect for tiny flowers! I always think in my head I don't like the smell of lavender but then I get something with lavender and I freaking love it lol now I want this. You will be blown away by this oil, if you try it Brooke. It is the most gorgeous version of lavender that I have ever experienced, and that is to say nothing of its efficacy as a very nourishing luxury face oil! I highly recommend it!